An extramarital affair.Almost a cliche, yet to the people having the affair it can become the center of the universe.At least at the beginning. 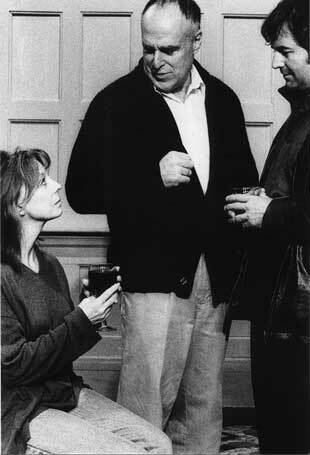 In Betrayal, playwright Harold Pinter works backwards.The first two scenes are in the present.Scene one, a man and a woman having a drink in a pub having ended their seven year affair two years ago. She, Emma (Suzanne Ford), looks tense. He, Jerry (Stephen Hoye) is superficially more relaxed. Their conversation is banal: How are (the children)? And how are yours? How is your spouse? Emma discloses she has been up all night talking with her husband, Robert, and that she and her husband are splitting up afterRobert has confessed that he has had many affairs. She feels betrayed and there ensues a very British discussion of who has betrayed whom. Many uncomfortable little silences between the two follow, not the uncomfortable silences of strangers on a blind date, but the kind of awkward silences that can only exist between people who once were intimate and now are seemingly disconnected. She admits she has told her husband about their affair. Jerry is aghast as Robert is his best friend and they have had a long time business relationship.The two men have had lunch that very day and the cuckolded Robert had not let on he knew. Jerry&#146;s sense of being betrayed by Emma overwhelm any empathy he might have felt. The remaining action goes back in time, from the chilly breakup in Emma and Jerry&#146;s small London flat where they have played house for seven years to the torrid beginning when Jerry has hidden in Emma&#146;s bedroom hoping to surprise Emma and declare his passion for her should she come up to fix her hair. A cynical Robert (Richard Fancy) comes in at the end of the declaration, obviously suspecting even before the affair has begun. &#148; There is no doubt to anyone but Jerry why Robert keeps pushing the game. This is the only thing that&#146;s ever happened.&#148; The affair is the focus of their lives, they have lost perspective.In the final scene of the affair the two are having a squabble, not unlike the squabble of a long married couple.Emma says, &#147;It&#146;s just an empty home.&#148;Jerry replies, &#147;It&#146;s not a home.You have a home.I have a home.&#148; They cancel the lease.The affair ends not with a bang but a whimper.Pinter, however, having structured the play in reverse, leaves the audience in an upbeat mood with the last scene being the one in which Jerry is declaring his feelings for Emma. Despite sounding like this device might be kitsch or confusing, it works. Richard Fancy is perfect as the cynical publisher husband, his disdain palpable in his slightest move. Stephen Hoye is the likeable, affectionate lover Jerry who really does not understand as much as he would like one to think.And Susan Ford is the stiff upper lipped wife who wants more emotionally than either man is ready to give. There is a brief, but delicious, appearance of Chris McCabe as the Italian waiter for whom his job and food are everything. Yet Emma feels betrayed when she learns her husband has had affairs and Jerry feels betrayed that Emma has revealed their affair to Robert. Betrayal is in the eye of the beholder.